My Beef with Meat | A Practical Peacemaker Ponders . . .
My Beef with Meat: The Healthiest Argument for Eating a Plant-Strong Diet–Plus 140 New Engine 2 Recipes, by Rip Esselstyn. Grand Central Life & Style, 2013. 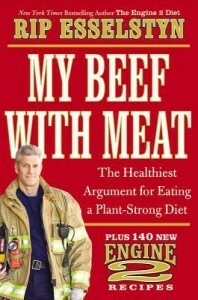 Rip Esselstyn’s second book–following The Engine 2 Diet–is clear, concise, down-to-earth, at times humorous, and will surely answer most questions people have about why we should be eating whole plants instead of animal products and processed food. This is a quick, go-to guide for such topics as protein, calcium, iron, what’s wrong with paleo, why grass-fed is no better than grain-fed, why oils should be avoided, and numerous other topics. Although mostly about health, the book also comments on animal suffering and the environment. And the recipe section!! I can hardly wait to try some of them. I was fortunate to hear the author live earlier this month at a local bookstore, and was impressed with his command of issues and facts, his friendly style, and the enthusiasm he conveyed. He’s an excellent ambassador for a healthier America.